The roots of art in Washington DC go deep. 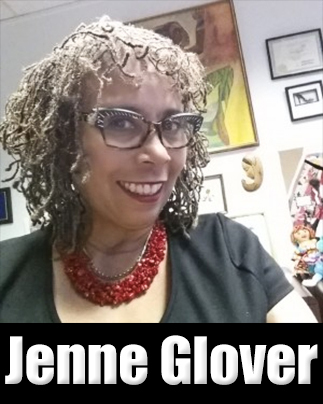 Artist Jenne Glover is a native Washingtonian and is well known throughout the artist community. 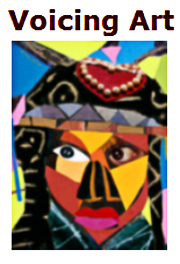 Her art works are in the collections of many, including the James E. Lewis Museum at Morgan State University, Colorado College, and Tri-Continental Industries, Inc. Over the past twenty years, she has shown in numerous solo, group, and juried exhibitions in Colorado, Georgia, Maryland, Virginia, and Washington, D.C.
"Working from an Afrocentric framework, my evolution from a figurative, expressionist painter to a mixed-media collagist evolved over 30+ years, and today, mixed media collage is my primary medium. Creating mixed-media art is like creating a jazz composition, it’s spontaneous and improvisational. Working without boundaries and restrictions, my challenge is finding the pulse, the beat of the unfolding concept, and going with the flow. My art works blend colors, textures, patterns, rhythm, and repetition. Compositions are constructed of magazine cutouts, ready-made materials, paint, oil pastels, fabric, and repurposed images from my earlier works that are altered, fragmented and reassembled on to canvas." Jenne uses brilliant colors with strong compositions to create her "from the heart" art. Her oil paintings, textile montage wall hangings, and mixed media art work range from figurative subjects to abstract collages. She has received many awards for her outstanding work including the Artist Showcase Award given by Manhattan Arts International and an Individual Artist Fellowship from the D.C. Commission on the Arts and Humanities. Jenne is featured in The Beginner's Guide to Collecting Fine Art African American Style by Ana M. Allen and the video Contemporary Afro-American Visual Artists produced by the University of Virginia-Bayly Museum. Jenne has a Master of Science degree in Management from the University of Maryland University College and a Bachelor of Arts from the University of the District of Columbia.